Print out and color this Magikarp Jump Pokemon coloring page and decorate your room with your lovely coloring pages from POKEMON coloring pages. Interactive online coloring pages for kids to color and print online. 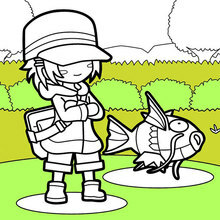 Have fun coloring this Magikarp Jump Pokemon coloring page from POKEMON coloring pages.